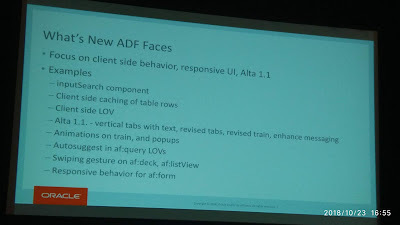 New stuff to ADF yea, but nothing that has wowed me. 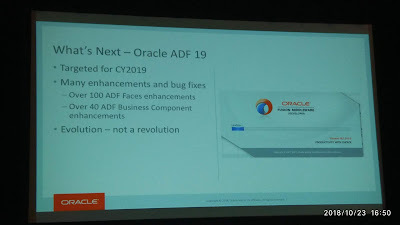 It is not supposed to wow, check the slide - evolution release with bug fixes and enhancement, but not revolution release. We dont need revolution, we need stabilized and solid release. A good release to better stability. do we have any status on the release date yet. We should ask Oracle about it. Please ask on twitter. Andrejus - have they fixed the REST App Module bug that you had made post about? how about the other one you found on Instance Name being wrong for VOImpl methods? They are still in 12.2.1.3.0. Unfortunately, I don't have any info about issues fixed in 19c. We need to wait and see. Hi Andrejus, can you tell me when this version will be available to download it? I am waiting for it and I am anxious to put my hands on it.. I wish I would know. Only Oracle people from DEV tools department could know it. But I doubt Oracle would disclose this info.